When summers are around the corners we really need that relaxing and peaceful cold place. If you don’t have air conditioning systems, there is no better time than this to install one. But when installing an air conditioning system, it is important to know what brand you are trusting for the purchase. Check for SEER ratings and other performance standards and guidelines as given by the government. 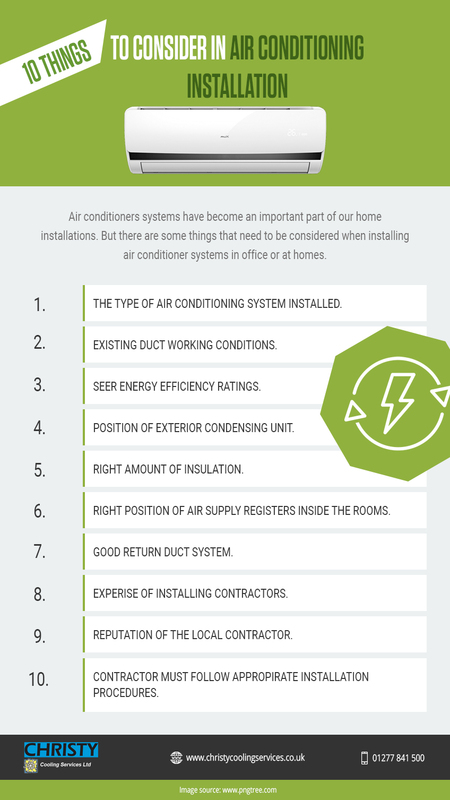 The below Air Conditioning Installation Guide will make you aware of various things that you should consider before buying any air conditioning unit. If you have an old duct, inspect then if they are still in the favorable working conditions. Next up is checking for appropriate insulation, there must be no place to lose. When installing a wall mounted air conditioner, it is important to position the airflow registers in the right way. Everything said right, it is equally important that the local air conditioning contractors must be well educated and trained to do the job. The air conditioning contractors must follow all the necessary installation procedures and standards that are set by the government. If you are looking for air conditioning contractors Christy Cooling Services Ltd is the here to serve you. We as air conditioning contractors pride to serve services for wall mounted air conditioner, multi split air conditioning unit, fridge systems, air conditioning installation, repairs and maintenance. For more about any services in Essex or around London, get in touch with us. Contact us and get a free quote.